Many believe that cycling training is one-off. – “Have you cycled a road, you have cycled all roads”. And of course, if you had to drive on the same road every day you would of course be tired soon. But as we cycle throughout Gothenburg we have a long way to get tired. To get a varied workout we have different focus on the rounds, which gives us both speed and strength and stamina. All this, together with our various speed and ambition groups, allows you to always follow our rounds. If you have not cycled with us before or are unsure of how to cycle in a group, then the calm group you start is. Or, follow one of our introductory rounds during the season. If you want to know which round we are driving a special day, please check our Facebook page. Sundays are dedicated to distance training. We have the first round in mid or late March and then we will drive distance training until mid November. We divide ourselves into the different speed groups where we drive so-called two-pair driving at an even and moderate pace. The aim is to be out for a long time with an effort level of around 50-65% of the max. If you think it’s too easy at first, it’s time to get tired eventually. Bike with light gear and high cadence (tramp frequency), as it is a way to keep your pulse up and improve the technique. By the end of the round, we always have a predetermined fixture. When everyone gets the same place, it will be a nice time at the distance pass. The distance pass is between 80 and 200 km long. The group always stays together during the round, get a puncture or any other problem we help as a group. On weekdays we ride shorter trips than on weekends. There are basically two different forms of exercise and it is everyday distance or intensive rounds. As in the distance cycling, we run in different speed groups, and the focus is on keeping the group together all the way. Weekday distance is similar to Sundays, but usually limited to about 50km. 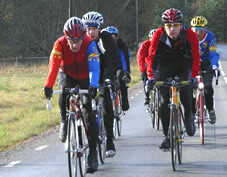 Here we cycle in pairs in groups on a hilly course of about 40-70 km. Group cycling is a priority, the training is about keeping the group together even in the back parts. Everyone must be on top at the same time. If you want to exert more, you can At the beginning of the hill, the rest of the runners let go and then ride a race. You can cycle on light gear at higher cadence or a heavier gear and lower cadence. No cyclist shall be in front of the group. Group technique training runs on weekday training during the season. Here we go to a little “demanding road section”, often as a roundabout or longback. Individual cycling for a predetermined time when you decide the number of repetitions. Remember to try to get the first and last time to take about the same time. Distance 30-50 km. Here we go to a “flat road section”, often as a roundabout or long flat straight line. We divide ourselves with even cyclists and cycle at a high and even pace for about 4-12 minutes, roll for about 3-8 minutes and repeat this a number of times. The couple determines the pace and number of repetitions. After the outdoor season we crawl into the heat and drive spinning. Winter training helps you as a member to keep going all winter so you do not lose what you built during the outdoor season.